White Pine is at the bottom of the Janka scale. 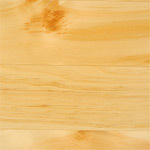 D-Select White Pine flooring is the highest grade of White Pine. Dime sized knots are included in this grade. Premium Pine flooring includes all the character found in the wood. Large knots, light yellow sapwood, and dark heartwood are found in this grade. Premium Pine will contain mostly sound knots. Standard Grade White Pine flooring has the same knotty appearance as the Premium grade, but missing and loose knots are allowed in this grade. More surface defects are also allowed.